. 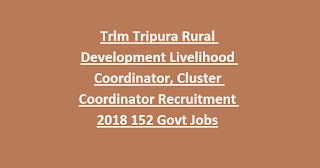 For more details regarding this TRIPURA Rural Development Department Cluster Coordinator, MIS Assistant recruitment 2018 please see below given information. These posts are temporary basis of 11 months only. As on 30-11-2018 upper age limits of UR candidates is 40 years. 5 years of age relaxation for SC/ST candidates. Cluster Coordinator-Graduate degree in Rural development, Social work, Management/Mass Communication. Block Mission Coordinator- Graduate degree in Rural development, Social work, Management/Mass Communication. The selection for TRIPURA Cluster Coordinator, MIS Assistant will be held based on merit in personal interview. In all districts concerned recruitment team will conducted personal interviews. Based on this district wise merit list will be prepared. These district level merit list will be consolidated and final merit list will be prepared by State level interview board. 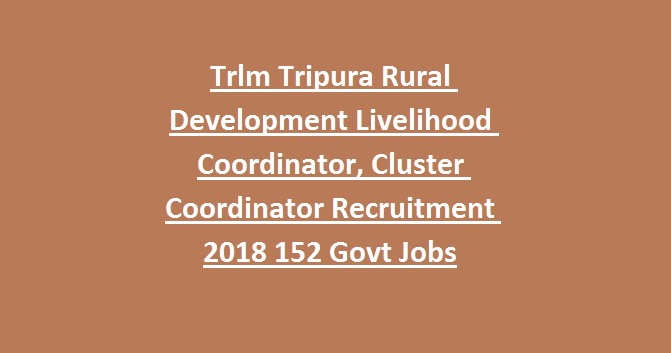 There is no application fee for this TRIPURA RURAL DEVELOPMENT Cluster Coordinator, MIS Assistant Recruitment. Interested and eligible candidates may have to carry the Original Certificates along with Self attested copies of educational qualifications, experience Certificate, citizen ship certificate, caste certificate, age proof certificate and nationality certificate, and application form attached with a photograph. Click here to see the official notification of Tripura Cluster Coordinator, MIS Assistant Recruitment 2018. Please share this recruitment notification of Tripura Rural Development Department Cluster Coordinator, MIS Assistant Posts to your beloved friends through social media websites and help them get a good job in a temporary basis.